One of the risks of adopting a dog is unknown medical conditions. When we adopted Indy in April 2014, we received some information about his medical history, but there was no record of skin issues or atopic dermatitis or allergies. There were mild symptoms on day one; we just didn’t realize what they were. On the way home, we stopped at PetSmart to buy a harness due to the foster’s recommendation. I noticed a red irritation on Indy’s armpit, which I thought was from the harness. A week later, he developed a bad hot spot just above the tail. Over the next few weeks, Indy displayed the following symptoms. Our vet did tests to rule out conditions like mange and prescribed oral antibiotics for the infection. After treating the bacterial infection it returned. The vet did a test and found that Indy is resistant to many antibiotics, so she prescribed one that he was not resistant to. After two months of ongoing itching, hair loss, and skin infections treated with oral antibiotics, prednisone, sprays (TrizChlor 4 antiseptic and Relifor antibiotic / anti-inflammatory), and anti-bacterial ointment (Muricin), our vet suspected Indy may have allergies. She did a blood test to check for environmental allergies, which came back negative. So she advised that we could try a food allergy test or intradermal skin test with a dermatologist for other allergies. We opted to start with the food allergy test. 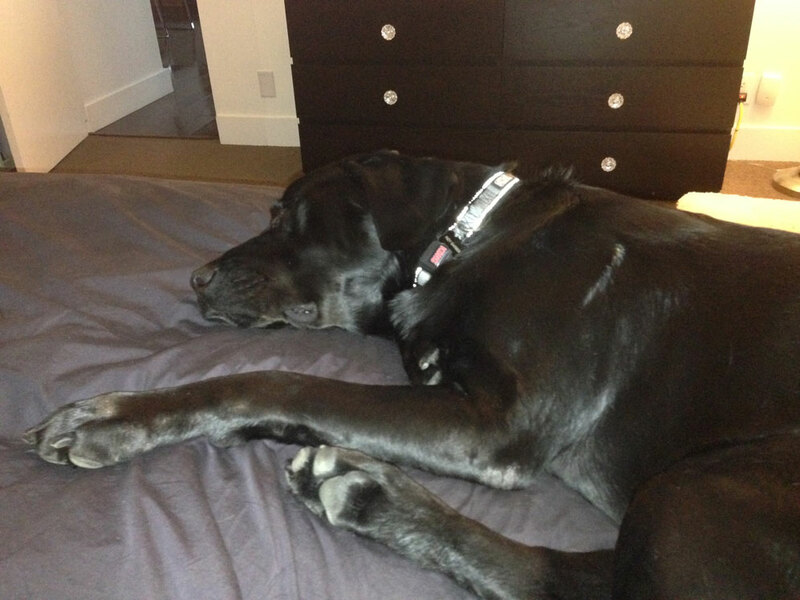 For eight weeks (July – August) Indy ate only prescription hypoallergenic kibble and biscuits. We could also give him carrots, light vegetables, or canned pumpkin to prevent constipation (a side effect of the hypoallergenic food). We also continued with the various pills, sprays, and ointments to ease the discomfort. By the end of the eight weeks, Indy was still exhibiting symptoms, so the vet ruled out food allergies. 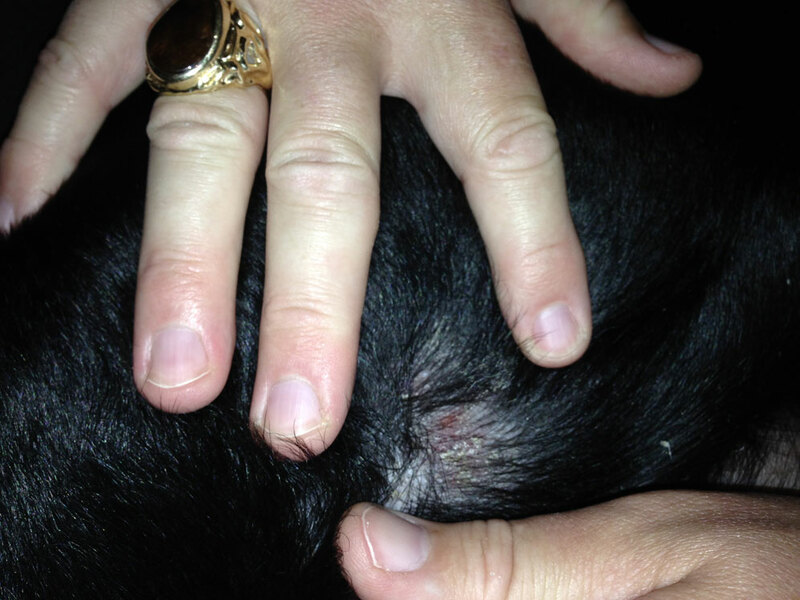 We decided to do the intradermal skin test and our vet provided a referral. In September we had an appointment with an animal dermatologist who advised that we needed to wait a few weeks to do the intradermal skin test until Indy’s latest round of prednisone was out of his system. The dermatologist started Indy on Atopica pills (200 mg once a day) and weekly baths with Oxiderm shampoo and Resi Keto Chlor antiseptic lotion. After a few weeks, Indy had a big improvement. There was still hair loss in new locations, but no recurrence in previous locations. He had just minor scratching but no sores or infections. The downsides: Atopica is very expensive and has potential side effects. 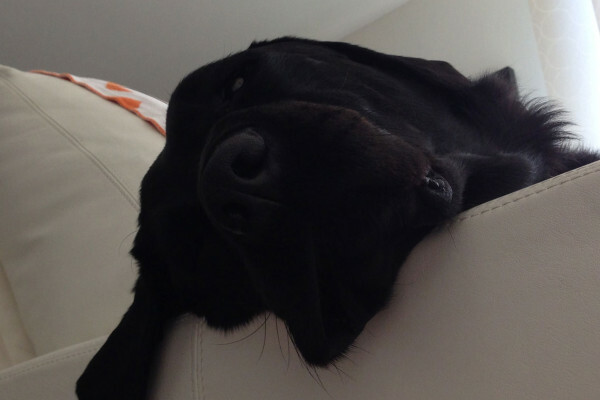 For Indy, it caused stomach upset – soft stool and occasional vomiting. We scheduled the intradermal skin test for the following month due to scheduling challenges. I called to confirm two days before and was told, ‘We had to cancel all tests that day due to a staffing shortage. Didn’t you receive a call from us?” (No – I did not.) At the time, Michael was working a contract job out of town (with the car) and arranged to take the day off and come home for the appointment. I was angry by the lack of communication and decided to find a new animal dermatologist. I checked the referral paperwork from our vet and saw that there was another option, which ended up being wonderful. 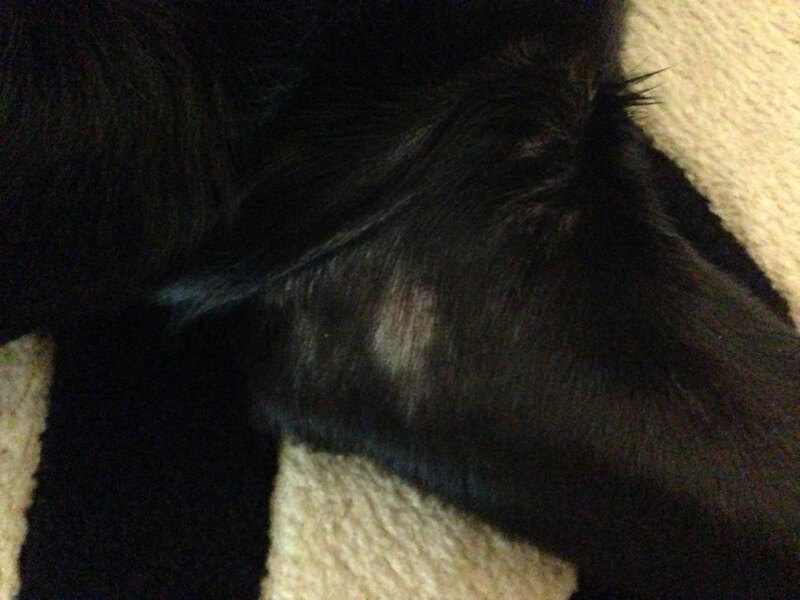 Indy had an evaluation appointment with Animal Dermatology Clinic in December and then we scheduled the intradermal skin test. Since Indy was doing so well on the 200 mg of Atopica, which is a high dose, I asked if we could drop him down to 150 mg and the vet said yes. Happily, Indy did fine on the reduced dosage, although he still had the side effects. Intradermal skin tests are performed under sedation, so we dropped off Indy in the morning (no breakfast) and picked him up in the afternoon. He did great – there were no complications. Then we got the news we had been waiting for – Indy is allergic to lots of things. The technician reviewed the allergy report and asked if we wanted to purchase the serum (yes!). She also provided useful care / prevention information handouts. Allergy Report – the form listed 82 allergens, each with a score of 0 – 4 to indicate the severity of Indy’s reaction (0 = no reaction, 4 = very strong reaction). There was (1) 4, (7) 3s, (20) 2s, and a bunch of 1s and 0s. He is most allergic to various insects, trees, and weeds. I wondered if some of those trees and weeds are not as widespread in San Diego, where Indy used to live – which may explain why he didn’t have symptoms in the past. Pollination Periods in Southern California – indicated the high risk months for the different weeds and trees. Controlling your Pet’s Environment – tips and things to do at home to minimize exposure to allergens. For example, Indy is very allergic to storage mites, so we wash the dog food container in between new bags of kibble. The technician left for a few minutes to create Indy’s serum and then showed us how to prepare and administer the shot. We also received a written immunotherapy schedule which started with the weakest concentration, gradually increasing to a full dose over a two month period. Since Indy is highly allergic to flea bites, the vet suggested we supplement his monthly flea prevention with topical Vectra, which we did for just the first three months, but did not continue. I thought back to the blood test for environmental allergies we did before the food allergy test. After reviewing the detailed report, I figured it was a false negative – most likely due to the medications Indy had been taking. Indy started the allergy shots in December 2014. The dermatologist said it would take 6 – 10 months to fully take effect, and during that period, Indy would probably need the Atopica. But, we could try to wean him off Atopica. Indy responded very well to the shots with no reactions or side effects. I was eager to wean Indy off the Atopica as soon as possible, but it took eleven months for the allergy serum to fully take effect. Here’s how we adjusted the Atopica (in consultation with the vet): December – mid February (pill daily for 3 days, skip 1 day), late February – May (pill every other day), June – October (pill twice a week on Tuesday and Thursday), first two weeks of November (pill once a week). Indy took his last Atopica on November 18, 2015! Now, with the bi-weekly allergy shots he is itch-free and comfortable! If your vet suspects allergies, find a dermatologist and do the skin test. If your dog has severe allergies like Indy, it is likely that the best way to manage them is through allergen immunotherapy (allergy shots). In the long run, it is also the most cost effective vs. ongoing pills and treatments for skin infections. For blood and skin tests there are certain medications that can cause false negatives. Before the tests, your vet should provide a list of medications that must be discontinued, along with the withdrawal periods. Carefully review the list and make sure your dog has not had any of the medications in the timeframe noted. Talk to your animal dermatologist about the effectiveness of allergen immunotherapy and be patient. Our vet advised that there is a 60 – 75% success rate and it takes generally 6 – 10 months (and possibly up to 12 months) to see results. We were lucky in that Indy responded wonderfully with no side effects and is virtually symptom free after 11 months of allergen immunotherapy. If your dog takes Atopica, be aware of the possible risks and side effects. Ongoing blood work is needed to check for issues. Also, be proactive and talk to your vet about the possibility of weaning your dog off it when possible by reducing the dosage and / or frequency. We had to play around a bit with the dosage to find the minimum possible at different times over the year that would manage the symptoms until the allergen immunotherapy took effect. There were times when I reduced the dosage, but the symptoms increased, so I reverted back and tried again in a few weeks. Be ready for lifetime management. It will be necessary to do allergen immunotherapy and possibly medicated baths for your dog’s lifetime. We give Indy a shot at home every two weeks and a bath every two weeks. Animal Dermatology Clinic has offices in five U.S. states as well as Australia. If it is not convenient to go to the vet to buy medication, you can buy it online. We purchased Atopica from Valley Vet (great price and they contact the vet to verify the prescription). This post is not intended to provide medical advice. It is a story of our experience diagnosing and managing Indy’s atopic dermatitis and allergies with our vet. As Indy’s foster mom for a short time – all I can say is thank you! I am thrilled that he found exactly the right family his second time around. I also adopted a dog with allergies, although nothing like Indy’s. Bowzer’s problem is managed by limiting our hiking (he has environmental and food allergies) and replacing it with frequent trips to the beach and swimming in salt water. He is also on a no grain no chicken kibble. But now I have somewhere to guide the next person who has an “itchy” dog who is miserable and for which the basic treatment doesn’t work. Thanks again!